Behind the Bit: Getting a competitive edge: Do you really want that blue? Getting a competitive edge: Do you really want that blue? Some offer more amusing advice like "groom and primp as if you're going to be on the cover of a magazine." For more tips read the thread -- while it's hunter/jumper oriented a lot of the tips are relevant. into a show ring on His Spectacularness. His Spectacularness. Isn't that a great phrase, and a great attitude? Psychologically it's the best strategy you can have when you prepare for a show. I get nervous at shows and I have a mantra to calm myself down: I've already won. I've already won. Yep, I've already won, but not in the sense of winning a ribbon. The big prize I've won is Harv, the best horse ever. It's all over, except that I need to make sure the judges see it too, and how hard can that be? I didn't always have a great ride, but judges loved Harvey. We put ourselves under a lot of pressure to do well, and it can backfire. Yes, it's important to take it seriously. We're spending a ton of money, our performance is public, and we want to be proud of ourselves and our horses. But a sense of humor is good too. 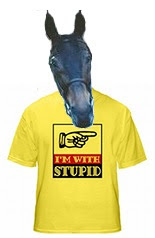 When I really mess up I imagine Harvey wearing a t-shirt that says "I'm with stupid." Fortunately, when I showed this article to Bob he reminded me Harv would never wear that. "Harvey prefers collared shirts," he told me. I LOVE this. Nice attitude. I will be saying these things to myself...and I don't show. :) Thanks for a great post! PS Thinking Harv looks good in the T-shirt. Cynic view. . .depends on your last name and what barn/trainer name you are riding under. I WILL admit to being a bit jaded. I did short stirrup as a child right outside of NYC in the 80's. Talk about the pigtails and politics *sheesh* I had parents openly glare at me (and my "normal" horse) after placing above their child. Realistic view. . .I rode a lot more then the Hermes wearing club because I did not go to boarding school or to Europe. I got into training (and then selling push button horses to the $$$ people) fox hunting and jumpers. I was never going to own a $50k pony or wear $2000 boots, so I just found my own niche ;)The only reason I would go into a Hunter ring would be to showcase a sale horse. . . In the "old days" when I did hunter/jumper, it started to get very political--one of the reasons I switched to dressage/eventing. Now that the money has followed horses and riders into the dressage rings, I fear politics have come along for the ride. Sorry to be so jaded, but I've sat and scribed with judges who have made comments here and there suggesting some prejudices. The scoring system is much fairer, still, but some riders just get the "edge," and the benefit of the doubt. In my arena at home, the Boys and I win every class we enter! I have developed a recent case of the show nerves-I think it is because I have not showed in so long. Also this is the first horse I have entirely trained myself so I feel very vulnerable to judgments. I do not want to fail or let Bodhi down by not showing him at his best. I have nightmares about falling off which has never happened to me at a show! I am even thinking of hiring someone else to show him! Has anyone else done that? OMG YES, Molly, but I'm more pathetic than that. It was for in-hand classes with Riley when he was a yearling -- I DID hire a handler for in the ring, but I was worried about handling him in terms of trailering and between classes on the show grounds. He'd never been in that charged environment, and at a few of the shows I'd been to I saw some babies do really dangerous stuff. Had no idea how Riley would react -- getting loose, rearing, kicking, hurting him, or me, or someone else. And, I imagined people saying that I'd foolishly taken on more than I can handle in buying a baby. I asked a few pros to handle him, but no one was really interested, so I ended up taking him myself. We practiced to death at home, Riley was a star behavior-wise and it really raised my confidence level. Has your horse given you reason to think he might be unpredictable at shows? I'd suggest going to a small show where you might not see that many people you know. Vet him out there, and then decide if you need a pro. There is NO SHAME in it, lots of folks do it (I know some who never ride their own horse but they parade around w/ribbons won by pros, as if they had done it). Thanks for the advise and commiserating. I have never done a yearling show (never had that quality of a horse) but I could imagine the stress! Bodhi and I went to the show grounds this past weekend. He was a champ-loaded up right away, immediately calmed down when we arrived, took in the scenery of horses pulling carts and even a donkey team all in stride. As soon as I got on and took him in the covered arena we both lost our cool (judge boxes are horse eating monsters) but we worked through it and had a nice ride. I am afraid though during actual competition I will choke up. I do not want to do that to poor Bodhi! I am afraid I will ruin his first show experience! The horse mommy fears we all get with our first babies. Thanks for sharing your thoughts and fears-it always helps! I always feel greatful to just be with my horses. They are great no matter what they do. It hasn't been since college, that I've shown someone else's horse (I showed IHSA in college). My horses are my babies. I don't want to screw them up or make them look bad, when it's me that is the problem. Nice post. When I was young I so happy to just be at the show! My horse was not fancy, but I loved riding him and he would consistantly pin high in Hunter/ Under Saddle classes because he just looked like a nice horse to ride. I always rode with a looser rein HUS cus I thought it was supposed to look like a nice hack. Sometimes we won, sometimes not. But I had more than one judge tell me we placed or won because I was smiling as I rode. Maybe everyone else looked a little cranky or tense? I know there were better horse and rider pairs than us, but sometimes we beat them due to attitude I think. I had nothing to lose, no one expected us to place, so not much pressure on me. It's supposed to be fun, right? I think we forget that sometimes. Great show hints. Best advice is to practice, practice, practice at home. I rode a little Arab against thoroughbreds in the AA hunter ring eons ago. Some judges overlooked the "wrong breed" and others did not. So I set my personal goals for the show and if I accomplished them it was a blue ribbon ride regardless of ribbons won or lost. Given the political nature of showing, don't let the judges dictate your enjoyment of your horse. Thanks for the great post! I have an amazing horse that I adore more than anything else, who is 99% of the time a perfect saint (instead of wearing an I'm with Stupid t-shirt, he sticks his hooves in his ears and says "I'm not listening to you Mommy, you're crazy, I'll take over from here"). Anyway, the 1% of the time kicked in at the last horse show when something fell over behind him and he *accidentally* bolted and bucked me off. I haven't gotten back to another show yet but I am sure when I do I will be battling some serious nerves. "I've already won" and "His Spectacularness" sound like great mantras to help me stay relaxed and not tense up and send him the wrong message. Like Molly, I've trained this horse myself (had him since weaning) and I think it makes me stress that much more. Glad to know I'm not the only one that lets nerves get the better of me sometimes!